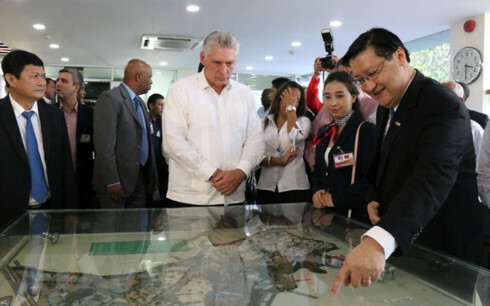 President of the Council of State and Council of Ministers of Cuba Miguel Mario Diaz-Canel Bermudez and his entourage visited the Saigon Hi-Tech Park of Ho Chi Minh City on November 10 as part of their official friendship visit to Vietnam. 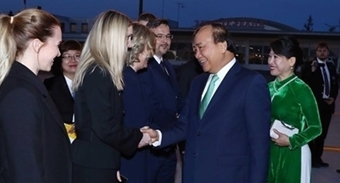 Welcoming the delegation, head of the Management Board of the Saigon Hi-Tech Park Le Hoai Quoc said that after 16 years of operation, the park has granted investment licences to 148 projects, including 93 domestic and 55 foreign-invested ones. Total hi-tech production of the park has reached nearly 45 billion USD with the rising trend. In 2018, the figure is estimated to hit 14 billion USD and is expected to exceed 20 billion USD in 2020. Quoc said that the park has started its second phase to match the city’s development orientations to become a creative city by fusing on completing a renovation ecosystem. Enterprises planning to invest in the park must be committed to investing in research and development and implement a roadmap to localise the supply chain, said Quoc. Miguel Diaz-Canel inquired about issues related to the investment model of the park, legal matters in construction and investment in the park as well as criteria for a hi-tech enterprise. He said that Cuba has approved a policy to develop high-tech parks but the country has yet to build a sufficient legal foundation in the field. Meanwhile, Cuba has yet to give specific standards for a hi-tech firm or product, especially in its strong biotechnology and pharmaceutical sectors, he added. The Cuban leader said that Cuba sees Vietnam as a model to follow and learn experiences from, expressing his belief to that Vietnam, with strong political trust and traditional friendship with Cuba, is a trustworthy destination for Cuba to study. He suggested that in the coming time, the park send a working team to Cuba at a convenient time to share experiences with the Caribbean country and work with a number of centres that Cuba is to form, including an IT centre and a science-technology centre in Havana University and other biotechnology and pharmaceutical centres of Cuba. The Cuban leader also proposed that representatives from the biotechnology sector of Cuba and the Saigon Hi-Tech Park work directly with each other to seek opportunities to form a joint venture or implement a joint research to develop pharmaceuticals in the park. Currently, Cuba has succeeded in producing specific remedies and vaccines, but the country has faced difficulties in medicine production due to low capacity of factories, he noted, holding that this is a chance for the two sides to cooperate in producing medicines in Vietnam.